COLOURS: If you want a bespoke RAL colour you must state this in the comments field when ordering & we will contact you for details. A 10% surcharge will be applied to the net price. Delivery time can take up to 20 days. What is the purpose of the Table Top Cart with Retention Rim? The Table Top Cart with Retention Rim is an outstanding trolley for separating packages and daily tasks. The cart is available in 2 different designs. The first design has 2 retention rimmed shelves, one on top and bottom. The second style has a rimmed upper shelf and the bottom platform is flat. The height of the rim is 45mm and is effective in keeping supplies from toppling off. The upper shelf can hold weights up to 80kg. Both platforms are constructed from derived timber board. 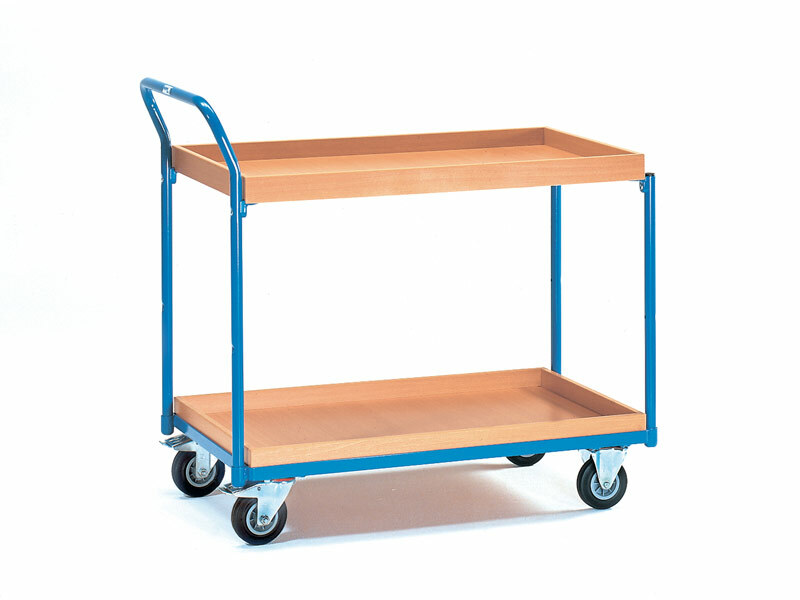 The frame of this trolley cart is tubular welded steel and is available in the colour blue. There is a handle located on the side of the shelved trollies, making it an ideal pull along trolley. 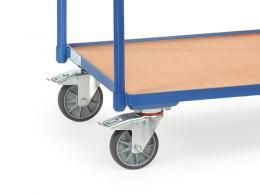 The four wheel castors help the cart glide with ease. 2 of the tyres can be fixed with a brake for stationary tasks. The industrial trolley can be used in offices, libraries, warehouses, and factories. Libraries can use the cart to return books to the shelf or for displaying new books. 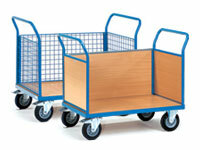 Offices can utilise the cart for daily tasks and delivering packages to different department. Warehouses can separate supplies and materials for projects or shipments. Factories can use this kind of hand trolley for multitasking and different stations. Who might use this Wooden Shelved Trolley? 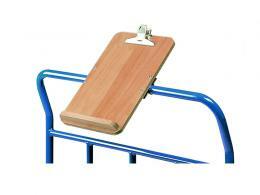 Employees of different types of work establishments will find this platform trolley useful. The cart can be loaded with daily or weekly assignments. The trolley can move files, packages, tools, or supplies, making it an ideal site trolley. Loading and unloading the cart is simple and less injuries will occur due to over exerting the body. The utmost care has gone into the construction of this product. The best materials have been used for the cart. The item is highly durable under normal work conditions.